This Saturday, January 27, the League of the South (LOS), a neo-confederate organization that seeks to establish a white, Christian ethnostate in the southeastern U.S., will hold its first rally of the new year on the steps of Florida’s capitol building in Tallahassee. In a post on the League’s website titled “Off and Running,” LOS president Michael Hill announced the event, the first since the League’s planned dual rallies in Shelbyville and Murfreesboro, Tennessee, collapsed under the weight of intense public protest. The post is styled as a militaristic “Directive 05012018,” a flourish that is emblematic of Hill’s embrace of warlike posturing and rhetoric. Hill’s post did not indicate a theme for Saturday’s rally. Past events at the Tallahassee capitol have attempted to leverage media scrutiny around issues of immigration, federal elections, and Confederate memorials, all with the end-goal of garnering support for the League’s pursuit of a balkanized south. 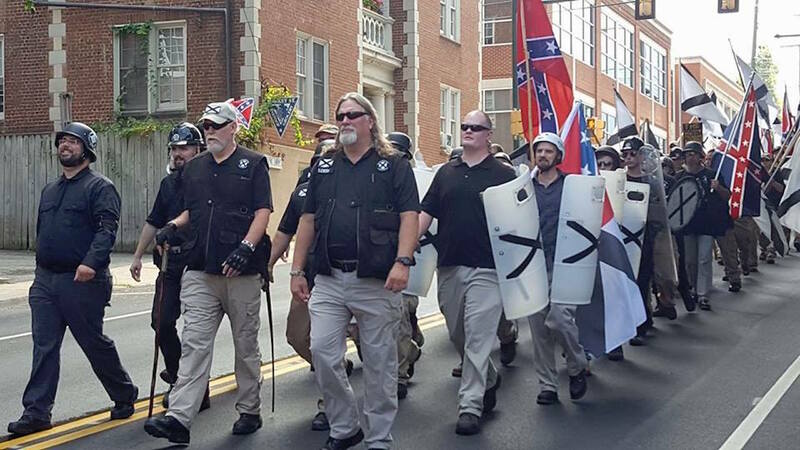 The League did its best to capitalize on the ethnic intimidation and political violence that defined far-right activism during 2017, traveling across the southeast to rallies in Auburn, Alabama, New Orleans, Louisiana, Pikeville, Kentucky, and Charlottesville, Virginia. At each of these events Florida LOS members — often referred to by Hill as “the tip of the spear of secession” — lead the charge. Matthew Heimbach, Michael Hill and Michael Tubbs lead white nationalists to Emancipation Park in Charlottesville. The Florida LOS, chaired by national chief of staff and convicted felon, Michael Tubbs, has been the most prominent and active chapter since 2014, when the League adopted its current strategy centered around public protests and demonstrations. Tubbs, a disgraced former green beret, was arrested and sentenced to four years in federal prison for his part in a plot to bomb Jewish and African American-owned businesses in Jacksonville, Florida. Although Tubbs is himself barred from possessing firearms, members of his chapter have organized armed marches and brag on social media about stockpiling weapons and ammunition for an impending civil war. Michael Tubbs of the League of the South at a 2015 protest in Tallahassee. Members of the League joined former LOS-member Matthew Heimbach and his Traditionalist Worker Party (TWP) last week in Knoxville, Tennessee, when the TWP attempted to crash an anti-abortion group’s protest of the nationwide Women’s March. 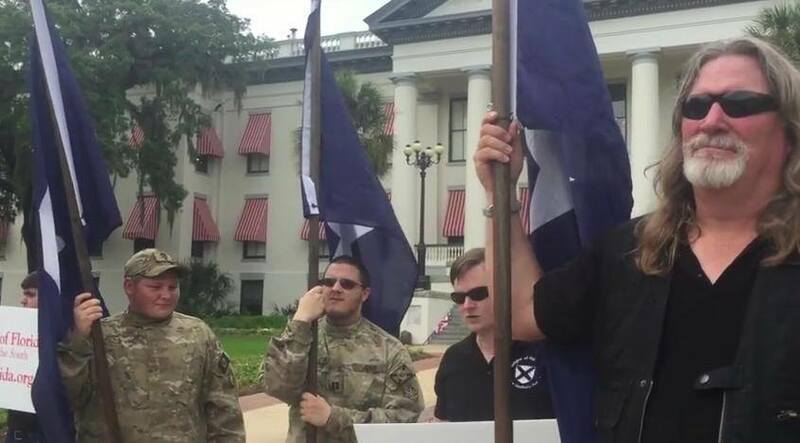 It is unclear if the League will stand with other NF organizations this weekend or ally with the Tallahassee-based Republic of Florida of Militia as they did for a 2015 protest in front of Florida’s capitol building.